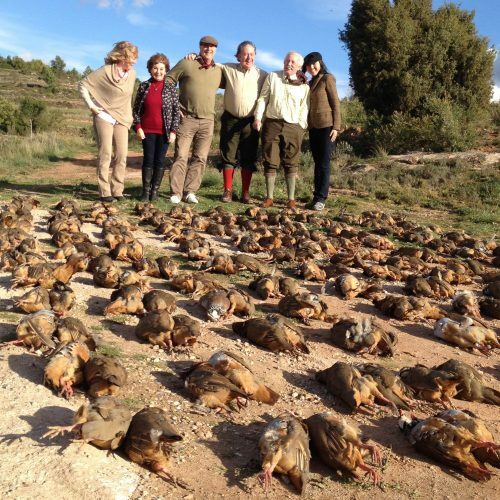 Athina Sporting are pleased to be able to offer some fantastic Spanish partridge shooting in Catalonia. Situated just 45 minutes from Barcelona. We have available shooting for groups of 4-8 hunters, shooting bags of 80 or 100 partridge per hunter per day. Shooting will take place over two days and can be upgraded with upland style shooting with dogs or to also include big game. Airport assistance and import permits of shotguns to Spain. 2 days, 2 nights in First Class accommodation. Meals and lunch with wine. Alcoholic drinks aside from with meals. V.A.T 21% on total bill. Minimum 4 hunters and maximum 8 in one group. Payment / Deposit – 50% of the cost for booking the dates and 50% one month before the hunt starts. Fantastic partridge shooting in the glorious Spanish countryside. Interested in joining us? Please contact us today!